2012 was yet another fantastic year of music in Indian Cinema and BollySpice salutes the unsung heroes of our music industry, our playback singers. The following ladies were particularly instrumental in making 2012’s songs soar that little bit higher as well as reserving a special place in our iPods, playlists and ultimately our hearts. Mamta Sharma burst into our music players and blasted our speakers with ‘Munni Badnaam’ in 2010 and has not stopped to take a breath. 2012 saw her jump back into the arena with ‘Anarkali Disco Chali’ (Houseful 2),’Aa Re Pritam Pyare’ (Rowdy Rathore) and the recently unleashed ‘Fevicol Se’. Granted, these tracks were not world-dominating like Munni but they left no stone unturned when it came to entertaining the masses. 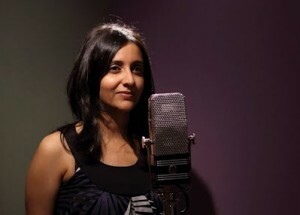 Nandini is bringing classic back to our Indian songs and how. Last year we could not get enough of ‘Bhare Nania’ (Ra-One). In 2012 our hearts went out to ‘Dua’ (Shanghai), her emotionally charged outcry to the heavens and we danced to the rocking mujra, literally, ‘Dil Mera Muft Ka’ (Agent Vinod). Even then, we hankered for more and are eagerly looking forward to hearing more of her in 2013. 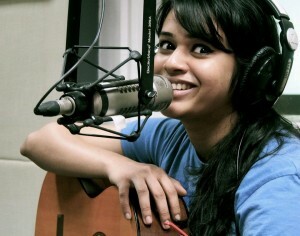 Arguably a newbie, Shalmali Kholgade took little to no time in making her way into our hearts via our ears. Her vocals are sweet and innocent one minute and seduction dipped in honey the next. Needless to say, we were not at all pareshaan to hear her on repeat crooning Amit Trivedi’s folk/rock fusion ‘Pareshaan’ (Ishaqzaade) or the sultry ‘Aga Bai’ (Aiyaa). ‘Daaru Desi’ (Cocktail) was just another feather in her already accomplished cap. We are definitely hungry for more songs from her in 2013. Ms. Chauhan is one of Bollywood’s most versatile singers. She can slip into the shoes of a sultry seductress just as easily as vocalising a subtle melancholic number. Once again her versatility was reflected in snazzy ‘Jab Se Mere Dil Ko Uff’ (Teri Meri Kahani), the celebratory ‘Gun Guna Re’ (Agneepath), the endearing ‘Mar Jaiyaan’ (Vicky Donor), the emotionally potent ‘Yariyaan’ (Cocktail) and the flirty ‘Chokra Jawan’ (Ishaqzaade). However, it was the flawlessly rendered ‘Halkat Jawani’ (Heroine) that was heavily applauded for, confirming her as the true item girl. 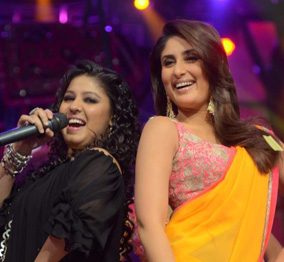 While it is arguable that Ms. Ghoshal is the go-to-gal when it comes to lending vocals to our heroines any day, 2012 has seen (or rather heard) this nightingale behind not only one but a number of key chartbusters. The year started of with the cheeky ‘Chikni Chameli’ that was quick to take the nation by storm. Usually relegated to singing melodious romantic solos/duets, Ms. Ghoshal was an unlikely choice for an item number, but you wouldn’t guess that by how she enthralled the masses with her transformation. Then came, ‘Raabta’ (Agent Vinod), ‘Thodi Si Haasi’ (Barfi) and ‘Jhalla Vallah’ (Ishaqzaade). The exotic ‘Mashallah'(Ek Tha Tiger) also reigned supreme while sweetly simple ‘Mahek Bhi’ (Aiyyaa) was heart warming. She concluded the year with the catchy youth anthems ‘Radha’ (Student of the Year) and ‘Saans’ (Jab Tak Hai Jaan), a breathtaking duet with Mohit Chauhan that sealed her fate as one of India’s best singers. Aditi Singh Sharma. Last year we feared Ms. Sharma may get typecast and be forever relegated to singing peppy youth anthem but she surprised us all with the power-packed ‘Main Heroine Hoon’. She shed her school girl vocals and delivered a rocking ballad that encompassed the gritty and glittering life of a heroine to perfection. 16 queries in 0.589 seconds.